After long spells of city bound life, there’s nothing more refreshing than driving through the countryside. The road becomes less congested, the air fresher, the landscape greener, and you begin to feel rested before you even reach your destination. 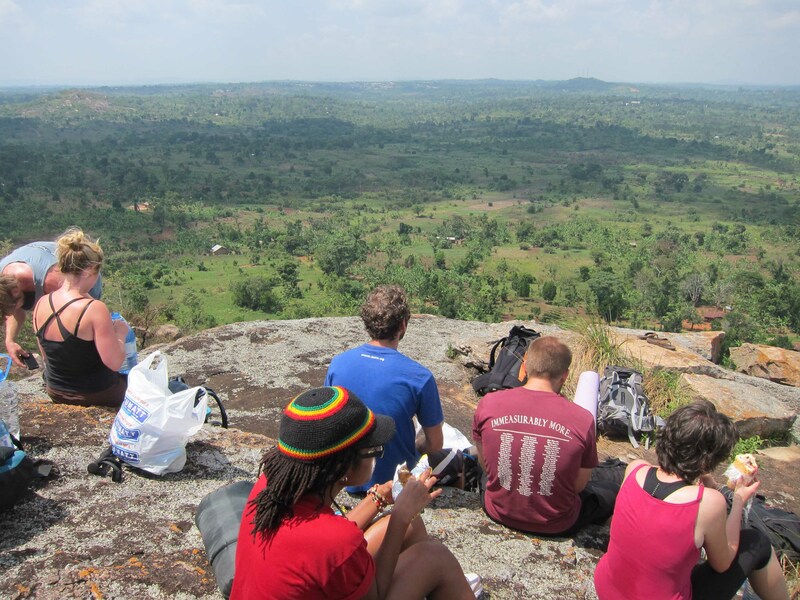 On the 10th of August, in the back of a little Rav4 and some interesting ladies, I found myself heading into the villages of Mukono district, in a carpool with the intrepid MCU group. I can’t quite find our destination on google maps but it was in an off road village called Kakinzi (I think). 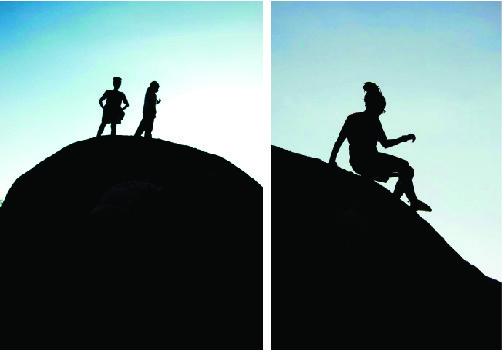 The plan was to do some rock climbing and camp out ontop of the rock that night. I’ve never been climbing before, and from the video’s I’ve seen it seemed to be quite technical, so I was happy with just camping out, spending the weekend with nature, but once everyone was geared up and there was enough equipment to be shared around I couldn’t resist having a go at it. 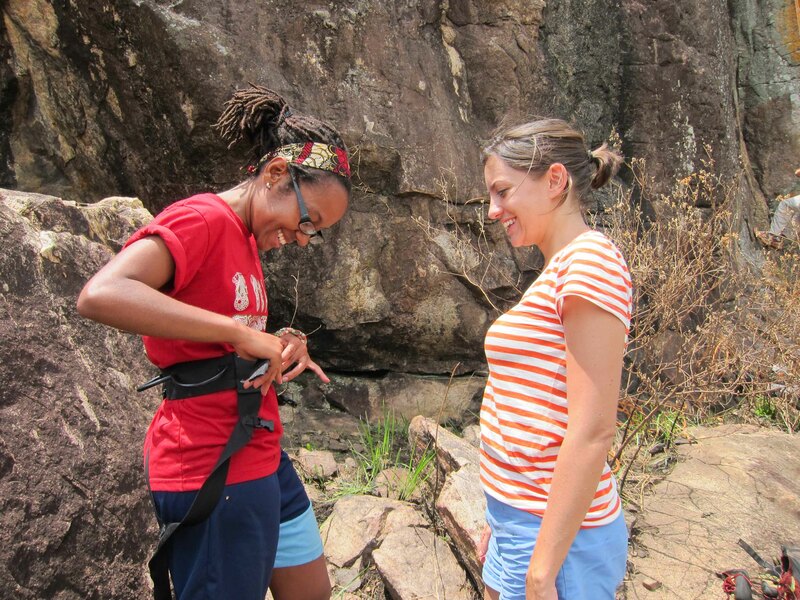 There were some experienced climbers in the group who were quite keen to show us the ropes and demonstrated on how to properly strap yourself into a harness, fix the Carabiner (my favorite terminology of the day, it just rolls of the tongue doesn’t it?) and other important equipment and technics. I must admit, peering down the vertical 60/80 feet drop, the little confidence I had mustered after the brief practice session suddenly disappeared. My heart skipped a beat giving a chance for hesitation and doubt to creep in, and I decided to pass up the chance to be in the first group to abseil down. Instead, I walked it (the uncharacteristic uneasiness) off, and found my way down the cliff face the sane way, by hiking down a rocky path that coiled down the side of the rock. From the bottom, climbing up seemed like a less intimidating challenge, although I knew I would have to eventually scale down once I reached the top. Once my turn was up, I already had the opportunity to observe a few climbing moves from the rest of the group, popular foot and hand holds, and which routes seemed harder than others, and eventually picked a less intimidating route for my first climbing attempt. Watching the more experienced climbers find their way to the top…without a harness and rope too. 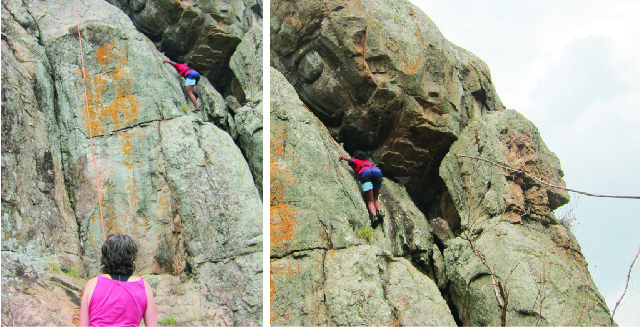 To hold myself up, wedged between the rock, was more of a mental challenge than physical one. At first, I didn’t quite know what to do, or how to get myself up, but with the occasional guiding and shouts of encouragement from the group below watching intently, I soon found myself absorbed into the climb. 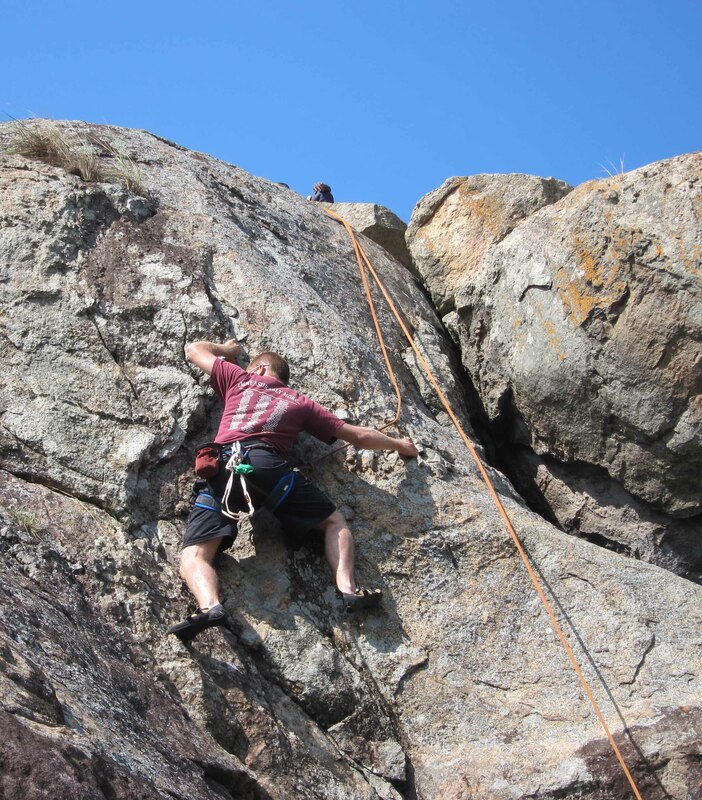 I was surprised to discover that climbing was quite an intuitive thing, and I found my legs and arms feeling around for holds and moving to their own accord. As I inched my way higher and higher, I became less aware of the painful contortionist climbing shoes (of which I was assured the tighter they are the better fit) and the awkward crotch grabbing hold of the harness and was instead filled with the thrill of a good challenge. The ambiguous holds on the rock became pieces of a puzzle I had to put together using calculated movement to solve the problem of how to get to the top. If I was to describe what climbing is about, I would say its about Movement, Trust and Thought. Each person had their own unique set of movements they used to get to the top, perhaps it’s because I was observing this through new eyes, but I felt like each persons climbing technique was different which made it quite interesting to watch. There were some tiny, flakey looking holds, at times mere chips in the surface of the rock which didn’t seem like much but once you managed to hook your foot in there and shifted your weight on to it in a moment of trust, were surprised to find it strong enough to hold you up. You not only have to put trust in the rock and its ability to stand strong but in your limbs and the moves they make. Lastly, like most puzzles, it involves a lot of calculated thought, and on the spot thinking. There were times I felt stuck, like I was out of possible moves to get any higher, but after a few moments pause, under the intensity of hanging from a cliff and the sheer concentration and will of holding your self up on the rock face, the mind becomes still and silent and you are able to see possible holds and maneuvers where there once seemed none. It really is a beautiful thing. The sense of accomplishment when you eventually reach the top is further accented by the breath taking landscape that stretch out bellow you, a perk of outdoor climbing. Greetings from above, that awesome feeling when you make it to the top! Scaling down for me was harder than climbing up, the act of leaning back so that you are perpendicular to the surface of the cliff and leaping downwards just felt so counter intuitive and took a bit of reassurance from my belayer to finally do it. It felt a little like that trust game where you have to fall backwards without attempting to break your fall and trust that your partner will catch you. 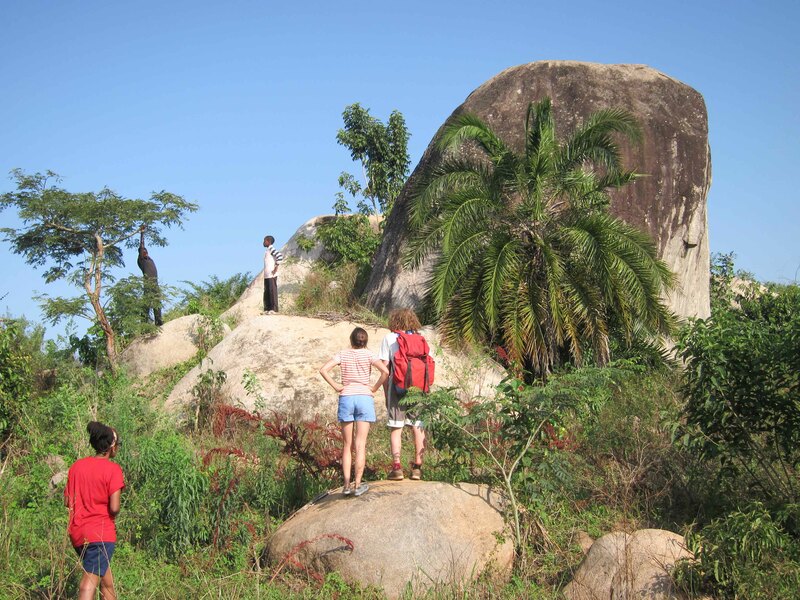 Aside from the bolted routes, the landscape was littered with crops of boulders that jutted out from the green vegetation, like beacons, and they eventually managed to beckon a few of us to go out to find them (led by a few excited local kids) climb them and come up with cool names like “Banana Bottom Slide” for them. 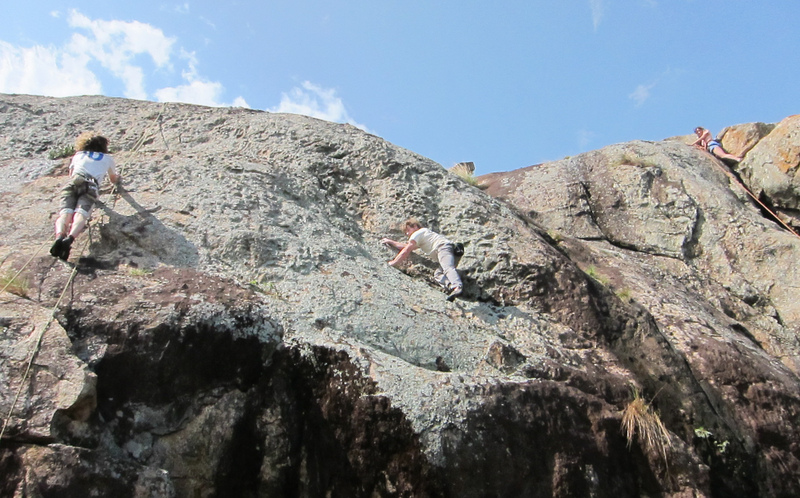 Looking for boulders to climb, conquer and name! Bouldering, (the act of scaling up and down boulders), was quite a different experience of its own, without the reassurance of a safety rope and Belayer, I found it a little more intense, and more technical on how to climb up and down safely by applying a few laws of physics and positioning your weight in order to create the most amount of friction possible between you and the rock, but at least if you were to fall, it wouldn’t be a very long distance down and you would land on thick vegetation to sort of cushion your fall. It was great climbing practice though to conquer smaller peaks before attempting more challenging routes up cliffs. Needless to say I had a pretty great weekend spent outdoors. Although it rained a little during the first day, like most tropical showers, it blew over quickly and the sun dried up the rock fast enough for it to be safe to continue climbing. 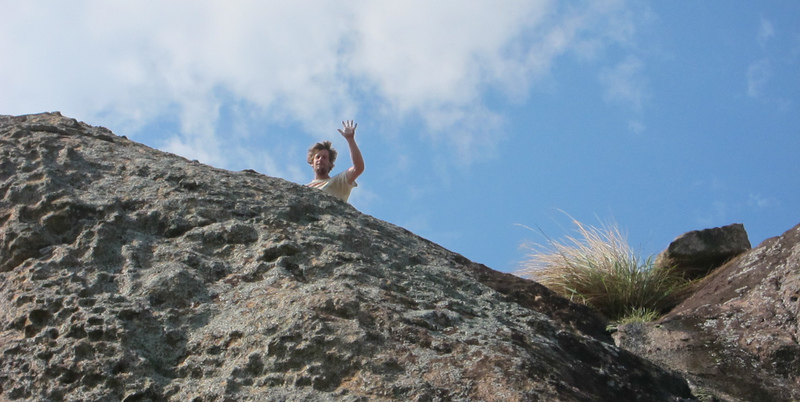 The locals around were friendly and mostly curious to watch these “crazy muzungus” climbing rocks, one of them, a friend and member of the MCU named Toks Amon was quite an impressively swift climber too. I can understand that climbing is not a sport for everyone, it’s slower, more personal, can get technical, and needs you to have the nessesary equipment (which can be expensive to aquire) and a belayer that you can trust your life with. But for those in whom I’ve roused a bit of curiosity in, I definitely recommend giving it a try, especially outdoors, if you ever get the chance to. I found it to be a natural thing to do perhaps due to the familiarity of my tomboy days spent climbing trees, roofs and water tank tower that I found something quite familiar in climbing, or maybe climbing is an innate skill in us all that has become dormant as we’ve evolved. Whatever the reason, I found climbing to be a beautiful thing, and would love to do more of it whenever I can. To the inspirational climbers that I spent the weekend at Luwazi Rock with, the raw nature and sprawling landscape, the clear skies that watched over us as we slept under its hypnotic stars and awoke to the warm glow of the sunrise, and most of all to the rock that challenged us and earth energy that kept me feeling steady and grounded throughout the following week, I am grateful. 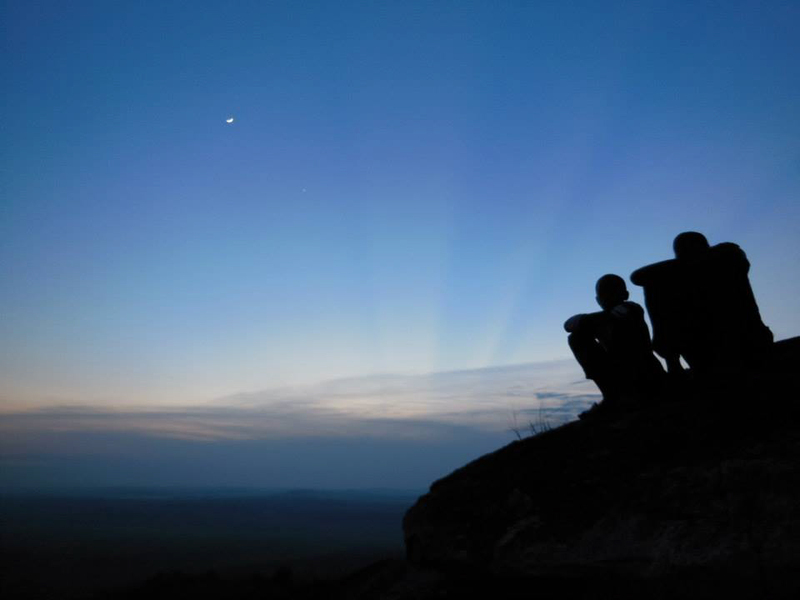 A night under a dark sky and vivid stars is always a blessing. One of the shots I managed to take on Geans Camera. P.S. I forgot to bring along a charged battery for my camera so I took a few shots from other peoples cameras when I could and borrowed some photos to use in this post. Photo credits go to mostly Gean Spektor and Robyn Yaker, Thank you guys! 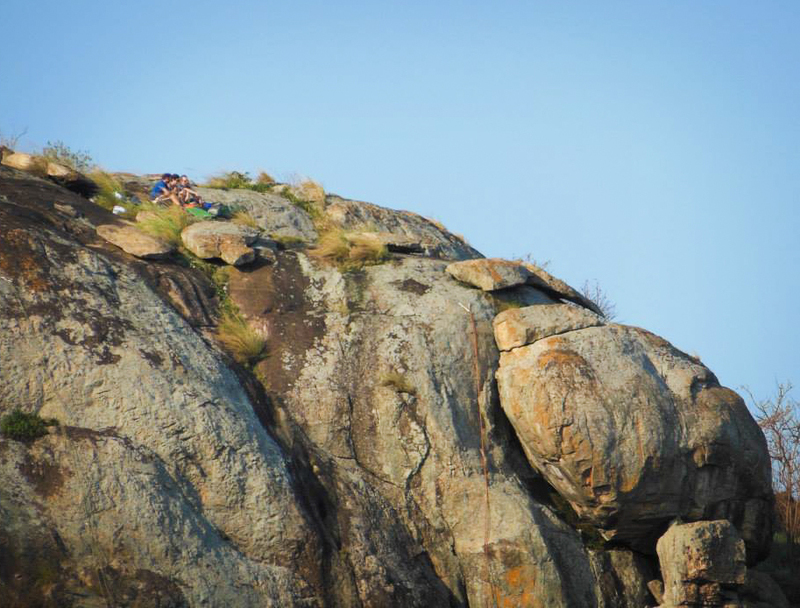 For some more amazing shots that capture the splendor of climbng Luwazi Rock, check out Tom White’s beautiful photography here. 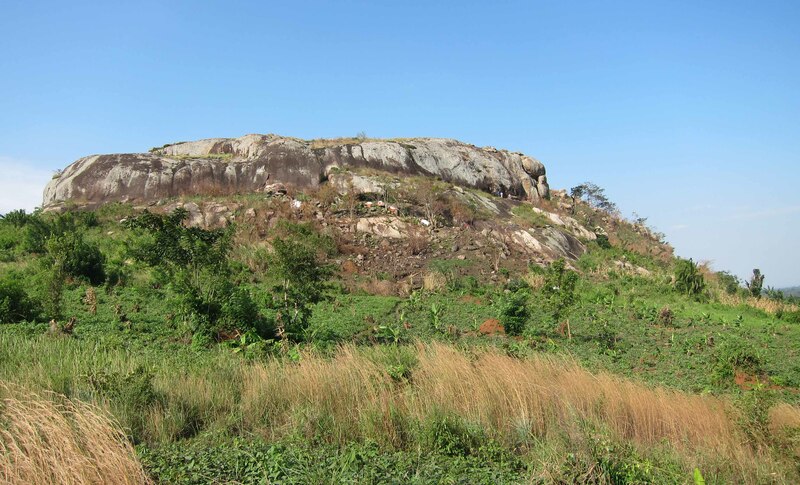 Check out the Mountain Club Of Uganda’s website for upcoming trips, Luwazi Rock is quite a popular trip that happens quite often, and has some great easy routed for begginers.